GothamCigars.com, America’s Online Cigar Store since 2001, releases three new premium cigar packages aimed at fantasy football league draft party events. GothamCigars.com, America’s Online Cigar Store since 2001, releases three new premium cigar packages aimed at fantasy football league draft party events. 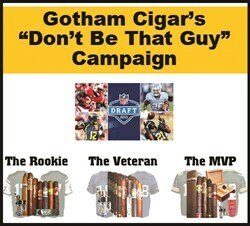 Gotham’s “Don’t Be That Guy” campaign aims to take the tradition of cigar smoking at fantasy football drafts to a whole new level and forever dispense with low quality, bland cigars being consumed on draft day. Fantasy Football draft parties are annual rituals that are fast becoming big business for restaurants, hotels and travel companies. Now cigar purveyor Gotham Cigars wants to make sure that participants don’t forget one of the most celebrated traditions of any fantasy draft, cigar smoking. They want to make the event more memorable by eliminating dull tasteless cigars from the festivities. Like owners of actual NFL teams, fantasy team owners want to celebrate a draft well done with a high quality cigar with their fellow football fanatics. Balani, a fantasy football fan himself, has hand-picked three unique cigar packages; the Rookie, The Veteran and The MVP. Each package has a selection of high quality premium man-made cigars perfect for savoring the fruits of a draft day well done. Each package features from 7 to 25 cigars and is priced from $29.99 to $150.00, with Free Shipping on the MVP Package. Each package is discounted by at least 40% compared to buying the cigars and accessories separately. Fantasy fans will enjoy cigars from storied brands such as Alec Bradley, Gurkha, Murcielago, Nestor Miranda and Guillermo Leon. All packages include a Torch Lighter and Cutter, while the MVP features a Spanish Cedar humidor that is sure to impress any draft day attendee. GothamGigars.com will ship any package directly to the draft day party location, be it a hotel, restaurant or home. Gotham’s unique “humidor fresh” guarantee ensures that cigars arrive fresh and ready to enjoy every time. The goal, to eliminate bad cigars on draft day and make the guy (or gal) who brings the best cigars, the MVP of their fantasy football draft day. You can see the entire selection of fantasy football at GothamCigars.com. Gotham Cigars offers customers one of the country's largest and freshest selections of Premium Cigars, Machine Made Cigars, Filtered Cigars and Humidors. Selling top brands like Alec Bradley, Gurkha, Acid, Phillies, Swisher Sweets and many more has kept Gotham a top pick among other cigar retailers. Gotham Cigars has received five-star ratings by the most trusted online comparison websites for its huge selection, fast shipping and great customer service. Everyday customer service is ready to help with any questions or issues their customers have, whether it is a cigar recommendation, to place an order, or an issue with an order, Gotham is always ready to help.